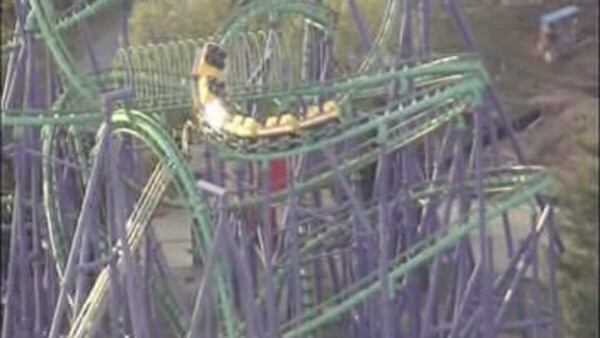 PRINCE GEORGE'S COUNTY, Maryland -- An amusement park roller coaster featuring a "cobra roll," "sidewinder loop" and "countless swift reversals" stalled Thursday evening outside of Washington, D.C., leaving 20 riders stuck 100 feet (30 meters) up in the air. Prince George's County Fire/EMS spokesman Mark Brady said on his Twitter account that the riders came to a standstill about 5:30 p.m. at Six Flags America in Largo, Maryland. The Berwyn Heights volunteer fire department said in a tweet that the cars of Joker's Jinx were 100 feet (30 meters) off the ground. Helicopter video from WJLA-TV showed six cars. TV video showed firefighters in a rescue bucket talking with the passengers, none of whom appeared to be in distress, Brady said. Brady said 10 of the 20 riders were safely brought to the ground by 8:15 p.m. Officials had initially reported that 24 people were stranded. Six Flags' website describes the Joker's Jinx as having a "spaghetti bowl" design, with the roller coaster doing "a cobra roll, a sidewinder loop, a corkscrew, and countless swift reversals." Six Flags America said in a statement: "Joker's Jinx did not complete its regular ride cycle, causing it to stop at a safe location on the track. The Prince George's County Fire Department is onsite to assist in getting the riders safely off the ride. The safety of our guests is our highest priority and the ride will be closed for a thorough inspection before reopening." Two dozen passengers became stuck, some for as long as five hours, on the same ride in August 2014. The fire department posted video of their rescue efforts on Twitter.